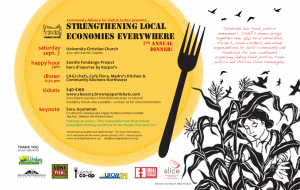 Sept 7: 7th Annual Strengthening Local Economies Everywhere Dinner! 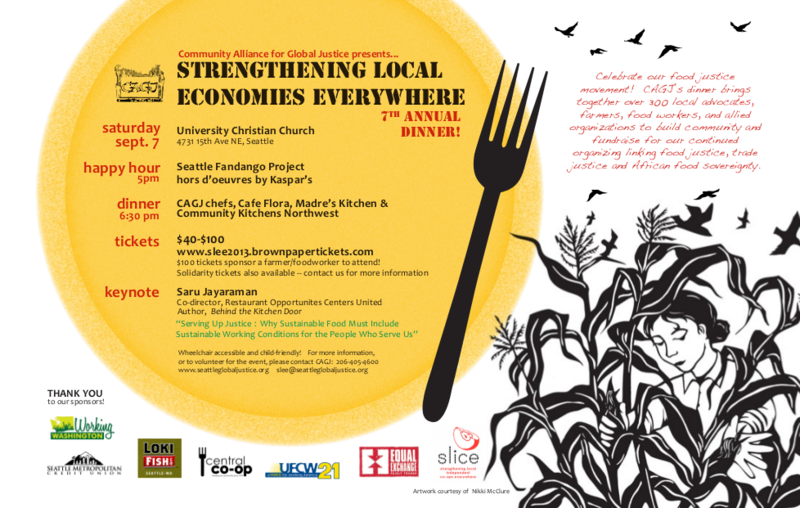 7th Annual Strengthening Local Economies Everywhere Dinner! Tickets available AT THE DOOR TONIGHT STARTING AT 5PM! Tickets are sliding scale, $40-$100. Kids are only $10. We sell out, so get yours soon! Or be a Table Captain and organize a table of 10 people! $100 tickets sponsor a farmer/foodworker to attend! Solidarity tickets available; contact us for more information. Happy Hour 5-6:30pm Enjoy libations, live music from Seattle Fandango Project, and delicious hors d’oeuvres provided by Kaspar’s while acquainting yourself with featured food justice organizations and groups promoting community development, food sovereignty and food workers’ rights. Get started early on our Silent Auction full of local and fair trade goodies, as well! Dinner 6:30-9pm Join us for a delicious dinner featuring dishes from Cafe Flora and Madres’ Kitchen, in addition to plates prepared by CAGJ’s in-house chefs and Community Kitchens Northwest using the seasonal bounty of Northwest farmers, ranchers and fisherfolk along with select Fair Trade ingredients. This year’s dinner will highlight in particular Pacific Northwest native foods. The Dessert Auction featuring more than 30 different desserts will make your mouth water! Saru Jayaraman is codirector of the Restaurant Opportunities Centers United, author of Behind the Kitchen Door, and director of the Food Labor Research Center at UC-Berkeley – This year’s SLEE dinner celebrates food service workers and their accelerating struggle for better conditions. Fair food means fair conditions up and down the food chain, including the people who serve us at the table. Join us and our friends at Restaurant Opportunities Center United, Working Washington, and Unite Here, among others, to celebrate the recent struggles of food service workers. To help in any of the following ways, please contact this year’s coordinator, Jasmine Zhang: slee@cagj.org, or call 206-405-4600. Thank you! and on our poster, website, & in the printed event program for 300. Be a Table Captain! Fill a table for 10 people, $400 – $1000 sliding scale… or come & bring a friend! Donate to Silent Auction! An experience, cabin get-away, massage, gift certificate, garden stuff…. Make a dessert for the Dessert Auction! Any wonderful creation of yours to help us top off dinner! Volunteer! (and get in for free)! Cooks, child-care, bartenders (people with liquor serving permits), servers (experience great but not required! ), and set-up/clean-up crew needed! We are still seeking a food service coordinator! This event is wheelchair accessible and child-friendly. Childcare available for kids 2-11 from 6:30-9pm. Posted in Agra Watch Blog Posts, Food Justice Blog Posts, News, Trade Justice Blog Posts, Uncategorized.